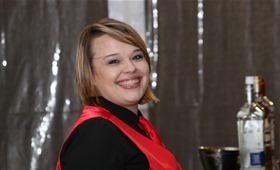 Bartender on Board is a licensed alcohol beverage caterer in Avondale Estates with the most knowledgeable bartenders in Georgia. Whether you’re having a cash bar or open bar, you’re your guests will be served in style. 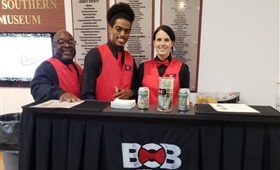 BOB is the alcohol beverage caterer that savvy customers choose again and again, for our exemplary mobile bartending services, professional & fun-loving bartending and staff, and our vast selection of beer, wines, and spirits. Who is BOB? 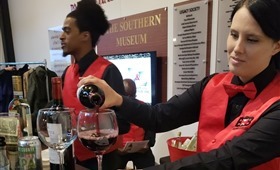 Bartender on Board (“BOB”) is Atlanta’s premier upscale alcohol beverage caterer and bartending service, and is based Avondale Estates since 2016. 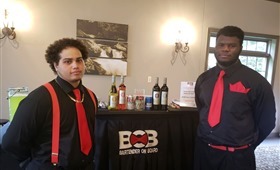 BOB is the alcohol beverage caterer that savvy customers choose again and again, for our exemplary mobile bartending services, professional & fun-loving bartending and staff, and our vast selection of beer, wines, and spirits. What sets BOB apart from the rest? BOB is an “Alcohol Licensed” caterer (both state and local). And that means that, unlike most bartending services, BOB can offer you full service, open bar and cash bar options without your having to purchase, and/or transport the alcohol! Online… Bartender On Board is featured on The Knot, and Wedding Wire, and has received rave reviews on Facebook and Google. 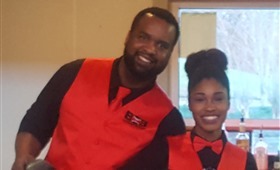 Among its many accolades, Bartender on Board has earned the esteemed 2017 Angie’s List Super Service Award and the 2018 and 2019 Wedding Wire Couples’ Choice Award. BOB is an “Alcohol Licensed” caterer (both state and local). And that means that, unlike most bartending services, BOB can offer you full service, open bar and cash bar options without your having to purchase, and/or transport the alcohol! Our professional staff of Executive Bartenders offers a wide array of hourly services to ensure your plans are carried out seamlessly. Bartender on Board is the Executive Concierge Alcohol Beverage Catering and Bartending service in Atlanta. Our style is to offer Fine Beverage Catering for the Adult Beverage Connoisseur. Our professional staff of Executive Bartenders offers a wide array of hourly services to ensure your plans are carried out seamlessly. We have a team comprised of professional, experienced, licensed and insured bartenders. We specialize in wedding receptions, corporate events, private parties, outside festivals and more. The most common question asked by couples seeking information on our All Inclusive Alcohol packages. The difference in package price is inherently the quality of alcohol chosen from Well to Top shelf as the level of service is consistent across all package offerings. Generally speaking, our cash bar packages start at $500 and our catered open bar package prices for an event up to 100ppl would range from $1000 to $5000 which includes the alcohol. Generally speaking, our cash bar packages start at $500 and our catered open bar package prices for an event up to 100ppl would range from $1000 to $5000 which includes the alcohol. Price dependent on the quality of alcohol requested (i.e. just beer and wine package or beer wine and spirits, types of beer (domestic, import or craft) Mid-shelf or Top-shelf spirits). We offer several different packages and services that can be scaled to meet your budget! Our most popular is our Mid-Shelf package offering. It offers the best $ value aligned with a lovely offering of contemporary, quality spirits. There is s always leftovers! By Georgia law, the return of unbroken Packages of Alcoholic Beverages shall be handled as a ‘‘no sale.’’ Leftover broken Packages of Alcoholic Beverages shall be the property of the event sponsor. That means any open packages or bottle are left onsite with the event host. What was the most memorable wedding you catered? Unlike food, each bar is set up differently, requires a different level of staffing, has different choices available to make drinks and cocktails. Was there ever a time you had to improvise? Each event is an act of improvising! Unlike food, each bar is set up differently, requires a different level of staffing, has different choices available to make drinks and cocktails. Just know… the level of service is the unwavering foundation by which improvising is never required.